"Just vintage finds, having something unique and really comfortable..."
It's not surprising that Melissa is a student of fellow fashionist Durand as well as a culture writer for GrooveEffect. 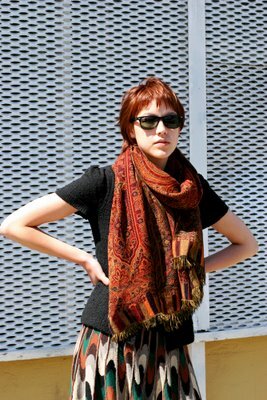 She looks chic wearing a gorgeous large scarf with a beautiful skirt. Notice how she's wearing knee-highs under her boots? It's a visual trick that lengthens the look of her boots. Also! Take a closer look at the great knit fabric of her skirt. Love her style! Just awesome how she is wearing fall colors in last spring. skirt is from anthropologie... cute outfit.